Happy Friday! We are starting a new series on the blog, Friday Favorites. We will share our favorite links from around the web. With Halloween around the corner, we are getting excited for costumes, festive recipes, and decorating ideas. ONE// Coton Color's Trick or Treat Bowl. 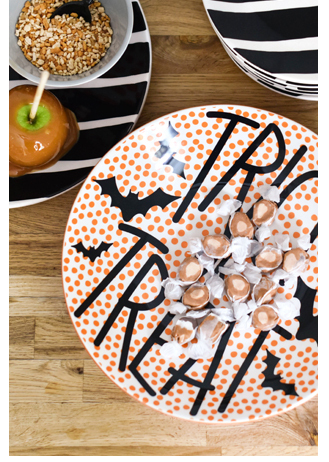 This fun bowl can be used for Halloween candy or caramel popcorn. Perfect for any fall party. TWO// Studio DIY's Tropical Drink + Pool Day Halloween Costume. We have always loved Studio DIY's costume ideas and this one is too fun not to share. THREE// Sugar and Charm's RIP Halloween Treats. This festive recipe is easy and would be a crowd pleaser for Halloween parties. We would spike the blondies for a Jackson Morgan twist on the recipe. FOUR// Polka Dot Chair's Floating Witch Hat Decorations. Who doesn't love an easy DIY for Halloween? This would be fun way to decorate for Halloween parties. FIVE// Swoozie's Ghost Napkins. For under $10, these napkins would be great to serve with a spooky cocktail.